John Olson was a senior at the high school in Warren, Pa., when he accompanied a buddy on a trip to the local Chevrolet dealership. His buddy’s father was shopping for a new vehicle and the teenage boys took the opportunity to tag along to see some new cars. 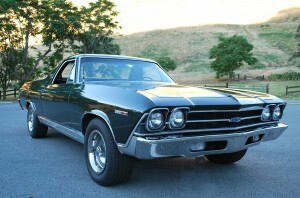 While the father and son were at one end of the dealer’s lot Olson was captivated by a new Chevrolet El Camino. There was something appealing about the combination car/truck that Olson never forgot. Of course, such a vehicle was far beyond the financial means of a high school student. And during the next three decades Olson would occasionally sight an El Camino, but he never seemed to be in a situation conducive to acquisition. By 2002, Olson was living in California when he began seriously pursuing his elusive dream car. The six-cylinder version held no appeal for Olson, nor did he want the super powerful SS model. 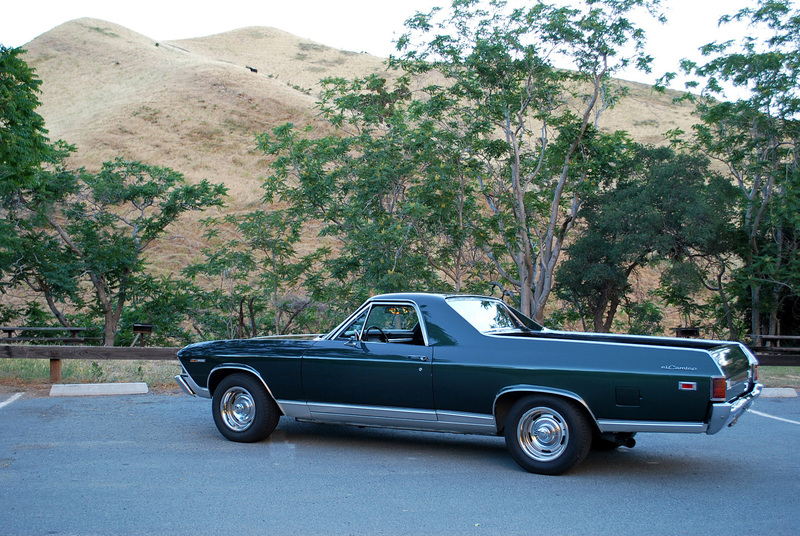 The mid-range El Camino, powered by a civilized 350-cubic-inch V-8 engine was the model Olson wanted. His search continued, he says, for two or three years before he found what he was looking for at a classic car dealership in Benicia, Calif. He discovered a recently restored 1969 Chevrolet El Camino wearing a coat of Fathom Green that appeared as if it had just been applied earlier that autumn day in 2005. Olson and his wife Earlene went to see the car. As soon as they saw it they knew it was a done deal. They took the El Camino on an obligatory test drive before buying the vehicle. Olson remembers telling the dealer that he would return the next day after transferring the some money from one account to another. Not necessary, the dealer said. Olson bought the vehicle using his credit card and drove his El Camino the 16 miles home that day. Papers that came with the vehicle indicate that it was built in the Freemont, Calif., factory. The gears in Olson’s four-speed manual transmission are selected via the floor shifter. “It gets up and goes pretty quickly,” Olson observes. As the vehicle was undergoing a restoration Olson reports he was told that the V-8 engine received a mild tweaking in order to squeeze out a little boost in horsepower with the help of a single four-barrel carburetor and an Edelbrock competition manifold. The El Camino currently rolls on radial tires mounted on stock rallye wheels. “Now it goes straight down the highway,” a pleased Olson says. It does have power steering. No air conditioning has ever been in the car. “It can be difficult and pretty warm,” Olson admits. That is despite outside air being sent into the cabin by the crank open wing vent windows. The all-black interior doesn’t help keep the temperature under control. The longest trip Olson has taken in his El Camino was about 70 miles. He has driven the car about 4,000 miles. “It is not so great for gas mileage,” Olson says. The 15-gallon fuel tank is filled with high-test, which is rapidly consumed at the reported rate of 9 to 10 miles per gallon. But the powerful rumble that tumbles out of the 3-inch dual exhaust pipes is most satisfying to the owner. Records show that both bumpers were replated with chrome during restoration but most of the rest of the brightwork only required polishing. A pair of slots in the front bumper provides openings for the parking lights to peek out. Inside the cabin Olson has replaced the serviceable black vinyl door panels with a perfect pair. Additionally, he replaced the lock on the glove compartment door latch. Behind the driver’s seat is a small storage area where the spare tire and tools are kept.